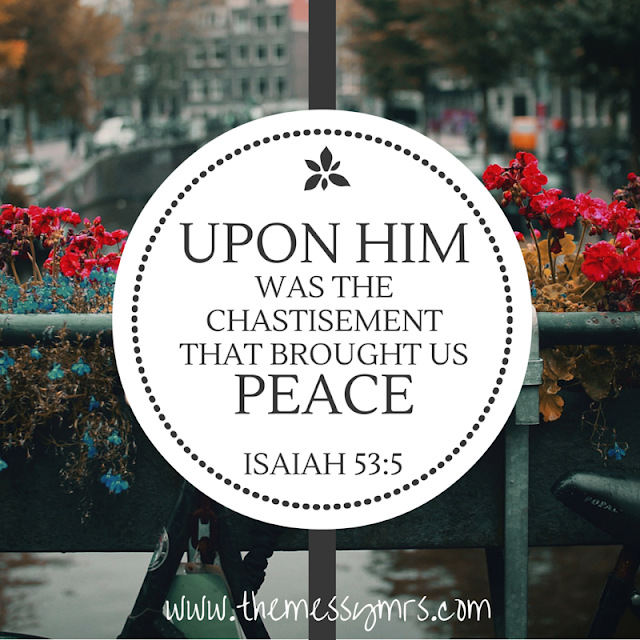 Today's passages are Isaiah 53:2-5 and 2 Corinthians 8:9. The story of Jesus is a weird one. I previously wrote about Jesus coming as a baby here. It is not at all what God's people were expecting. They were awaiting someone with a lot of political power who would give them freedom on Earth. But that's not what they got. They got a different kind of King: a baby in a manger that would give them a different kind of freedom. He came small, weak, poor, oppressed, mocked, and eventually He was crushed. He defied all human logic. He flipped every preconceived idea about Him on its head. Human logic was irrelevant. Human solutions wouldn't work to fix human problems, and God knew this. The entire reason I wrote this series for the Advent is to dial back on my standard Christmas crazy, and dial in to Jesus. Christmas is overwhelming, y'all! It's untangling Christmas lights, it's dealing with runny noses, it's Christmas parties, it's making food, it's wrapping gifts, and it really ends up with Jesus on the back burner. This year, I wanted to stop all that madness so my heart could overflow with sparkling jingle-jangle Jesus joy. But what has happened was a diva of a Christmas tree that took a week to put up, more holiday parties than normal, and a messy house I'm ashamed to talk about. Isn't life like that? We get so distracted by our physical lives that our spiritual lives suffer. You know why? The physical is so completely OPPOSITE of the spiritual. The physical is loud, stressful, and just plain selfish whereas the spiritual is quiet, peaceful, and selfless. It's a struggle to stay spiritual in a world that is nothing like what God is. We start to sound like a bunch of whiny kids in God's backseat wailing "are we there yet?" We're a bunch of whiners stuck in the ways of the physical life who complain that we're not experiencing God the way we want. Of course we aren't! Why would we? Humans are small, weak, and broken. We're always getting ourselves in trouble. That's just human nature. So naturally we'd look for a Savior to come in like a wrecking ball to crush our enemies. Except…. If our solution was like we'd imagined, things would stay the same and nothing would get fixed. Our solution had to become small to become one of us to save us from ourselves. God knew this about us. Christ had to become low to save us. He didn't come with wealth or power, and He suffered in every way a person can suffer. He gave up all the physical, so that we could gain all the spiritual. He became low so that we could rise higher. He was hurt so we could heal. He gave up His life so that we could conquer death.